I should be receiving ARCs (Advance Review Copies, also known as Proofs) in the mail next week. I'll deliver them to some beta readers with sharp eyes who enjoy being the first to read a book. Covers are done by yeocladesigns--amazing! This stage is our last chance to clear up the pesky little errors that creep into books despite hard-working editors and despite the fact I've probably read the dumb thing a hundred times! I listened to my computer read the book aloud before sending it in for the final setup. As long as I don't let my mind wander, I can hear the tiniest errors, like a pause where I left an extra space or when it reads sat instead of sad. The fact remains that an author can't step back far enough to see places where the reader goes "What?" I'm grateful to have faithful friends who are willing to read and point those spots out to me. 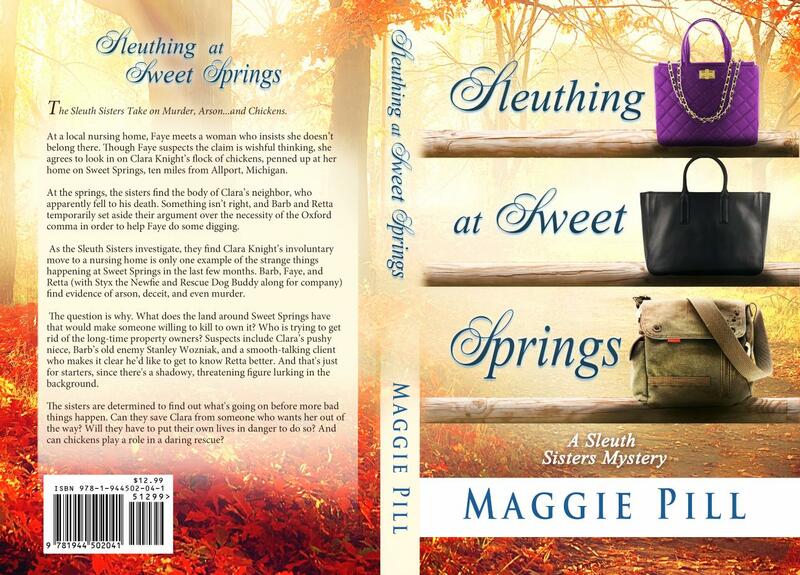 For example, a friend who read SLEUTHING AT SWEET SPRINGS noted that in one conversation I'd given away the killer from the first book, THE SLEUTH SISTERS. She was right to suggest I remove that paragraph, since people don't necessarily read a series in order. I've often stumbled into the middle and then gone back to read the earlier books, so it doesn't do for an author to put spoilers in later. It's always hard to decide how much backstory to include with each new book. I can't leave out how Barb and Faye formed their detective agency with the intention that Retta would not be part of it. Much of the humor of the series hinges on the fact that Retta butts in yet usually ends up providing valuable help. I try to salt bits and pieces of the sisters' past and personalities into the storyline without bogging it down with repetition from the previous books' events. Anyway, the books are in the mail, I'm told, so we're a step closer to another installment. I did have a librarian tell me last week that she loved THE SLEUTH SISTERS. Then she asked, "Are there any more of those around?"